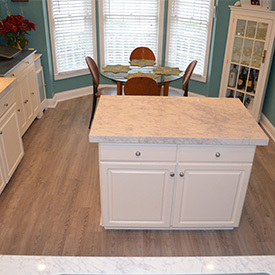 Meg knew she wanted a warm, easy-to-maintain floor that would complement her remodeled kitchen, and the adjacent foyer and dining room. Jean wanted a traditional hardwood look, without the expense and maintenance of hardwood, for her open-concept condo. 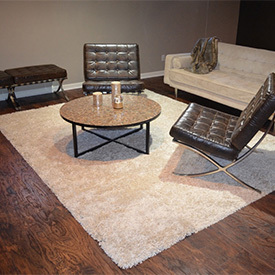 Vanessa wanted new floors that were suited for her basement – durable, easy-to- clean and resistant to moisture. 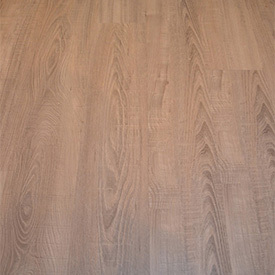 Their searches ended with three different brands and styles of luxury vinyl tile (LVT), which has been the top-seller in the resilient flooring category for more than three years now. 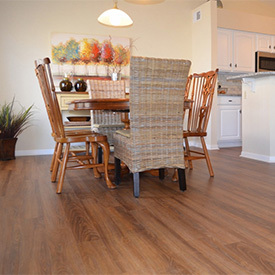 While vinyl flooring has always been water-resistant, the newer Waterproof Plastic Composite (WPC) styles are completely waterproof and offer a major attraction for people with pets and children. Leading manufacturers also have improved the replication process, producing very realistic wood, tile and stone aesthetics. In this case, all of the customers chose wood-looks in the Adura line, Carpet One’s Invincible H2O line and Coretec. Self-locking tiles and planks often can be clicked together and floated, meaning not attached to the subfloor, which can be a faster, friendlier way to install because you don’t need glue. A qualified flooring salesperson should inspect your job site to ensure the installation method chosen is suitable, and get accurate measurements to determine the square footage of flooring that needs to be ordered. Routine maintenance simply involves vacuuming to keep grit off the floor, and mopping with a cleaner approved by your product’s manufacturer.